If you are a fan of daily deal site LivingSocial, you can save 30% off your next purchase with promo code CELEBRATE30! This is offer is good off any amount, but the maximum discount from this code is $30 and expires 6/30/13. Only one promo code per credit card and not valid on takeout and delivery orders; restrictions apply. There’s so many options to choose from and you can see all offers here. 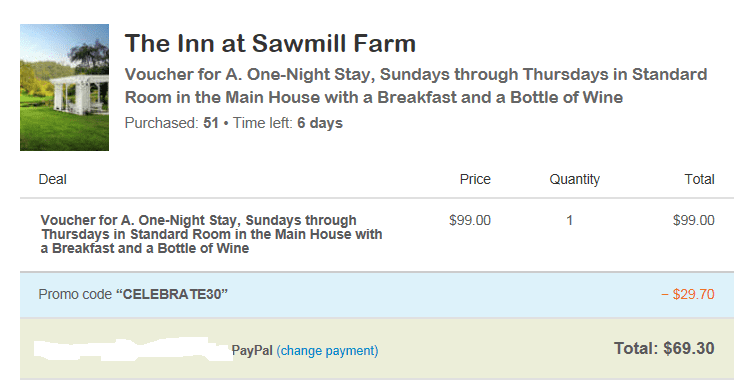 I’m happy that the code works on escapes (max $30 discount), which is perfect for a little getaway (pictured above a trip to the Green Mountains of Vermont for a one-night, wine and breakfast included stay for $70 after code!!). Don’t forget to check out with your Ebates account or Shop At Home account to save an additional 2% cashback your order!